Lancelot is an approximately 3-year-old red brindle male who was found as a stray with Gus running loose in Alvarado, Texas. He is not tattooed, so his age is an estimate. 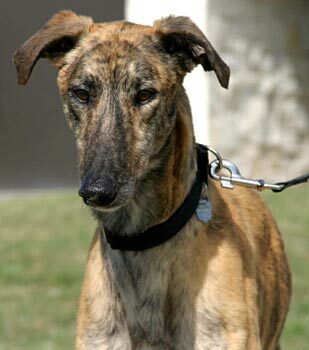 He is a beauty, with those soulful, amber eyes and very striking brindle markings on his face. 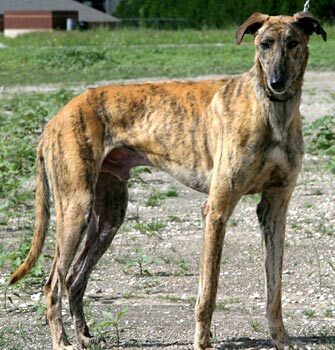 Lancelot has a personality to match his good looks and is an easy-going, laid-back boy. It is not known at this time if Lancelot is small animal or cat tolerant. Lancelot had nothing in common with his name other than being a sweet and gentle boy when he came into our home several weeks ago. Perhaps being a stray was an improvement over his prior life. He was so afraid and leery of us and so unlike any greyhound. He thought his life was meant to be in the back yard in the corner under a bush all of the time. We had to drag him into the house to eat and sleep or to be with us. He would stop three feet away from us and wonder what horrible thing would happen next. No following us around or leaning on us as greyhounds do. Our hearts were breaking. With the help of the resident greyhound he watched her and very slowly began to trust us enough to take a treat from our hand. Being on a leash and taking walks gave him confidence to lean on us for courage. Getting him in his crate for the night was not a happy easy experience for any of us. Finally, the night came when he walked right in all by himself and we were so happy. Since then he has begun to evolve a little more each day and does not even sleep in his crate anymore. He walks very well on leash, will take treats now and even will come up to us for love on his own. He has warmed our hearts and rewarded us with his trust. It was a few weeks before he would even pick up a toy or want to play. Now he plays with sister and gathers toys for his bed, even the occasional shoe. Nothing has ever been destroyed, just moved around when you are not looking. He no longer wants to be outside unless for a short sunbath where he is trying to learn to cockroach like sister. Lancelot has overcome so much in his gentle manner. To watch him play like a puppy will warm your heart. I feel he would love to be with another dog for the security. On walks he has seen other dogs, children, strangers and all outdoor experiences without any problems or shyness. He is thankful for his meals and waits to eat very gently. He will let you know that it is time to go to bed and sleep the night through and wait for you to wake him. Lancelot has given us so many rewards, especially when we see him looking for any of us and then the wag of his tail. He is the perfect example of the most forgiving dog. All that is left for this very special boy is to find his forever home to make the rest of his life a happy one.